People are looking at the Windows 8 App Store as a potential market similar to the iPhone’s App Store, but it could be the beginning of the patch management system of your dreams. Slowly, Microsoft is opening the kimono on Windows 8, revealing features that, up to now, seem consumer-oriented. There are more reportedly on the way, and the one that has my interest is the rumored App Store. It's hard to ignore the potential now that Apple has validated it. The iPhone/iPad/iPod Touch App Store has 425,000 apps and has generated an estimated $3.6 billion in revenue, with developers pocketing $2.5 billion and Apple getting $1 billion in very easy income. Of course Microsoft could have all kinds of reasons of doing it, from altruistic to selfish, but from where I sit, there is another potential benefit, one that can't be measured in dollars, but none the less has great value. Tell me, how secure is your PC? 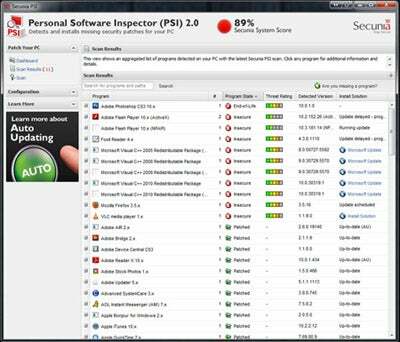 Secunia, a Danish security firm, has a nifty little scanned called Personal Software Inspector that checks all of your installed apps for out-of-date or obsolete versions. Take a look. I was 89 percent secure before this scan. PSI handled a few updates for me, grabbing the newer versions of Firefox, FoxIt and the VLC player. The Visual C++ libraries were handled by Windows Update. There's nothing I can do about using Photoshop CS3 at this point. But the point is PSI caught the issue. Now how many of you know of this program and use it regularly? The fact is, I'll bet many of your users don't know how secure their PCs are if you haven’t implemented network access control or some other method of regular scans for updates. Granted, in a best-case scenario corporate setting, PCs are locked down with varying levels of security to make sure unapproved apps aren't installed. But we all know that there are many seriously lax environments where it was pretty much anything goes, too. Keeping all of the apps on your computer up to date is a chore since that often means going to each developer separately, or running each app and using a "Check for Updates" option. The beauty of my iPhone is I simply run the App Store app and check for updates. Everything is sent down in one shot and my phone is kept up to date. Sure, iOS updates are separate and I still have to remember to run a check for updates, but seriously, how much can you expect Apple to do for you? And Android users don’t even have to remember to check for app updates … the OS does do it for them. I've covered security issues enough to know that the bad guys love unpatched systems, and once a vulnerability is disclosed, they go right for it in the hopes people will be slow, lazy or lackadaisical about updating their PC. That's how these guys thrive. If everyone's PC was up to date security-wise, malware would be far less successful. So I see the upcoming App Store as a way to keep everyone's PC up to date and patched and hopefully more secure. If you remember to run a check for updates, that is.